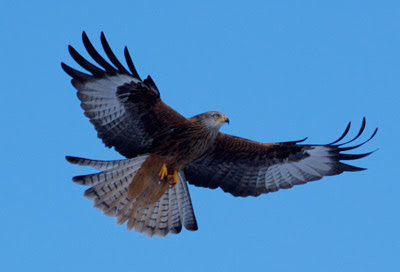 As of tomorrow, Sunday 29th March, feeding of the kites will be taking place at 3pm and not 2pm as it has been for the winter months. The birds don't know that we move the clocks hence the need for us to change Our routine to fit with theirs..
We've had visits from two different BBC programmes this month - more details will be posted when I have it. I've not been able to send up any photographs tonight as I've had a disaster, with both an important hard drive and its backup having become unreadable. A piece of software is currently attempting to rebuild one but it could take more than 4 days by what its managed to do so far.. I'll upload more images as soon as I am able. 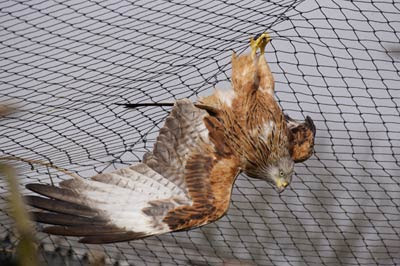 Fingers crossed..
We have another red kite in rehabilitation. It was brought in last week by a Vet from the Hafren Veterinary Group - Llanidloes. It was in a collision with a vehicle (if my memory is correct) and was treated in Hafron before coming here. Seen here hanging like a bat from the aviary netting, its now flying well, and has consumed a good amount of food, so will likely be able to go back out to the wild in a day or so. Tony Cross is expected to come by and liberate the kite while I'm away.. Yes, I’m heading off for a break after feeding the kites and (provided no gremlins strike tomorrow) should be away for a what will be the first week off for 12 months. Colin Horlock, who some will have met here at weekends, will take over the feeding of the kites. Tomorrow will be the ‘run through’ of what needs to be done while I’m away. Say it quick! My youngest sister, and mother will be holding the fort, answering phonecalls, etc, etc. I’ll still receive emails so the booking of the photographic hides will still work.